We are nice people, let's get in touch. If you have any questions, requests or inquiries for us, just ask. We want to hear them. EnzoTact©PRO, the only milk protease test on the market. EnzoTact©PRO, a quality discriminator that can be used on site during any stage of process, for fast, actionable monitoring. Bacterial-produced proteases can still be present in milk after pasteurization. The presence of these proteases in post-pasteurization milk can lead to sweet curdling of the milk, making it unfit for consumption. EnzoTact©PRO is a rapid test method (taking only 30 minutes), designed to test post-pasteurisation milk for the presence of residual proteases. The two-step test procedure is intended to be used by an analyst with experience in aseptic technique in a laboratory or other controlled environment facility. The Relative Fluorescence Units (RFU), emitted after contact with the target proteases, correspond with a concentration of these proteases. 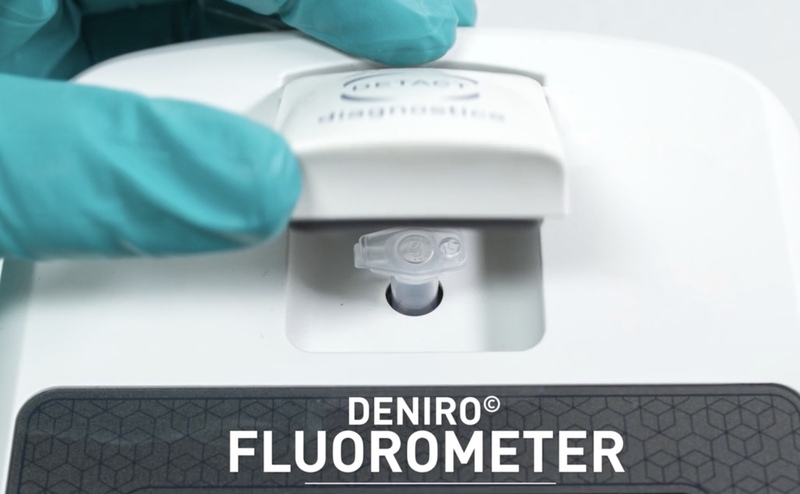 The detection reaction is measured using a specially designed small hand-held Near Infra Red Fluorometer, the DeNIRO© NIR Fluorometer. The DeNIRO© NIR Fluorometer workflow. This user-friendly fluorometer delivers results using quick, simple assay procedures. The large, colour touch screen allows you to easily navigate through the various options. Calculations and settings are automatically performed by the instrument. At the beginning of every day and with a new batch of Substrate, a blank should be performed. The blank will automatically be subtracted from readings by the DeNIRO© NIR Fluorometer. 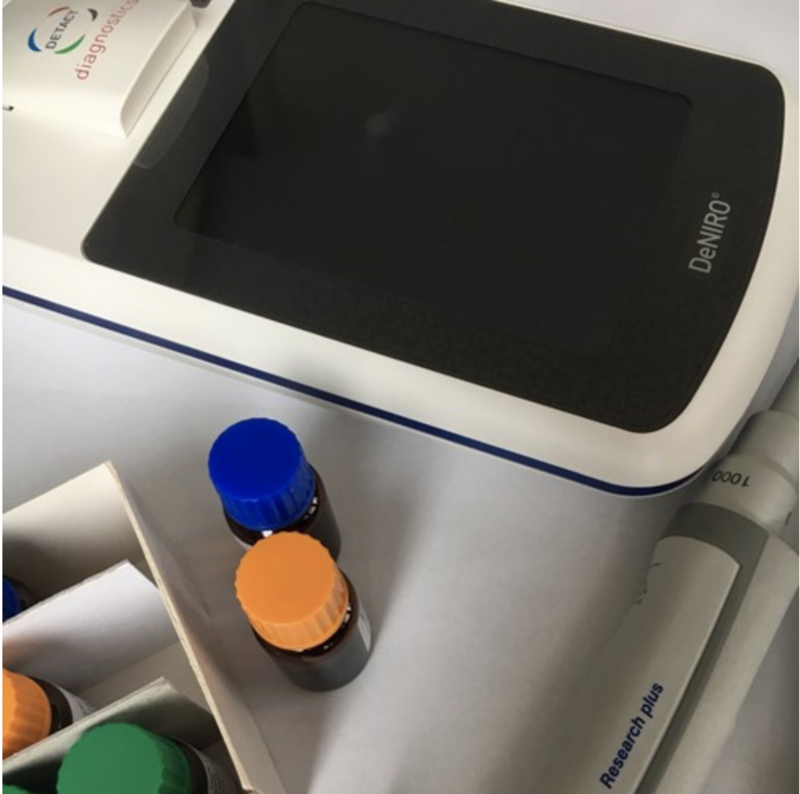 It is optimised for measuring bacterial and/or enzymatic activity using Detact Diagnostics BactoTact© and EnzoTact© assays. EnzoTact©PRO will contribute to the shift of the market from consumption of loose to packaged dairy, which will increase the volume of packaged dairy products. Currently, less than 10 percent of the marketable milk consumed in countries like India and Pakistan is consumed, processed and packaged. This shift is expected to accelerate in the near future as a result of the growth of the middle income class, the need for more milk of a higher quality, as well as increasing urbanization.